Tangled and True: summer berries. I'm all about summer berries, I can't get enough of them. I dream about them at night and am constantly trying to figure out new ways to incorporate them. I am officially asking you to lay all your berry ideas on me, so I can live in berry heaven for a few more weeks! freezer jam (so easy--follow the instructions in the sure-jel pectin boxes). Muffins-- mix blueberries, raspberries and blackberries with slivered almonds in bran muffins. Salads--toss with spinach & greens, nuts, chicken, and poppyseed vinaigrette. Also perfect in desserts. 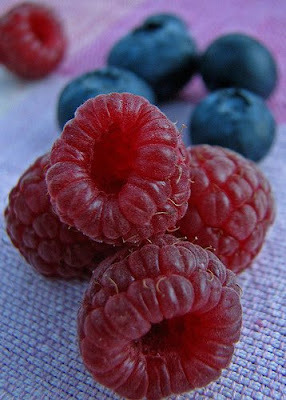 Freezer--rinse, dry, and arrange berries on a cookie sheet. Freeze til solid and transfer to freezer bags. Voila. Smoothie and dessert fixins all winter long. I have been making homeade berry sorbet in my ice cream maker so I can have some for even longer! I just used the recipe that came with the ice cream maker. I also freeze them for smoothies too. By the way sorbet is super easy to make! Check out The Pioneer Woman Cooks- (google it) The Blackberry Cobbler #1 is to die for! It is so easy to make and you will get tons of compliments. Hubby and I ate it for breakfast until it was gone. Oh, and I made it with blueberries, not blackberries. this is going to sound so boring but i feel so in tune with your berry worship right now. greek yogurt with fresh raspberries and blueberries topped with honey and slivered almonds. your picture made me want to go make a bowl RIGHT NOW. Here is one of my favs: Lemon Zabione . Simple and sooo good on a mix of berries! Try berry rahka, you'll love it! Buy a tub of rahka (250g), whipping cream and a small bag of frozen berries (strawberries work very good!). Take the berries out to defrost a hour or 2 before you want to use them. Whisk the cream up until thick, fold in the rahka and then the berries. Lift the berries out of the juice when you do this though or it will go too sloppy. Taste it, and if its a bit sour you can sweeten it with icing sugar.